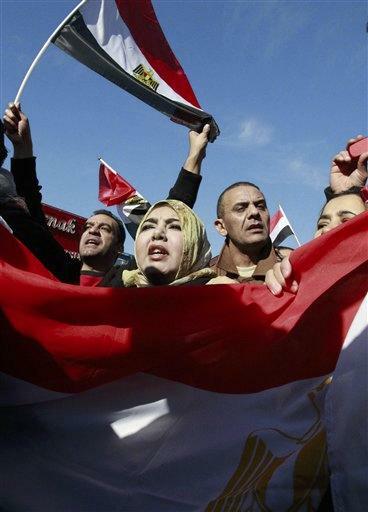 NEW YORK (AP) - Waves of celebration rippled out of Egypt and washed onto U.S. shores Friday as Egyptian-Americans looked to a future of democracy and Arab unity after the departure of President Hosni Mubarak and his three decades of authoritarian rule. Crowds gathered in New York, suburban Detroit and the nation's capital to mark Egyptians' success at toppling a leader after three weeks of sometimes-violent protests across Egypt that many feared would end in futility. "I feel freer than I've ever felt in my life, although I'm 10,000 miles away from my homeland," said Ashraf Abdelhalim, 47, on Manhattan's Upper East Side near one of the largest mosques in the New York area, where at least 60,000 Egyptian-Americans live. Even while in America, he said, he felt "the oppression and the fear" from Mubarak's reign. "Now the dictator is gone," he said. Sherine El-Abd found herself sobbing with joy at her home in Clifton, N.J. A board member of the Washington-based nonprofit Arab American Institute, she predicted that the military in Egypt will "oversee a clean, democratic election." "Listen, if the person with the thickest skin and the densest brain in the world - Mubarak - got the message the military gave him, the message is loud and clear," El-Abd said. People gathering at the Lebanese American Heritage Club in Dearborn, Mich., the heart of the nation's largest Arab-American community, expressed hopes for a domino effect in the Arab world. "The Arabs were taken for granted," said Arab American News publisher Osama Siblani. "And you know what happened? The Arabs presented to the world one of the most wonderful revolutions in modern history." In Washington, a small group gathered before a rally at the Egyptian Embassy, signing the Egyptian national anthem. Two young girls held signs reading, "EGYPT CHANGE." "This is a new day for Arabs all together," said Radia Daoussi, a 40-year-old Tunisian who said she wanted to show solidarity with the Egyptian people. Hisham Morgan, 34, director of the Muslim-American Society Youth Center in New York, agreed it was time to congratulate the Egyptian people - and the world. "I am very hopeful for Egypt," he said. "I see a lot of love between the Egyptians - Christians, Muslims, the youth, everyone." Gatherings were also happening Friday in Los Angeles, in addition to larger, better-organized ones nationwide set for Saturday. Nearly 200,000 U.S. residents identify themselves as Egyptian, according to a 2009 survey by the Census Bureau. Omar Zaki, a 44-year-old insurance agency owner who lives in Riverside, Calif., said he couldn't believe his eyes when he read the caption under the television images of jubilant protesters in Cairo's Tahrir Square. "I almost had to pinch myself," he said. He believes the movement will ripple throughout the Middle East, noting the old Arabic saying that Egypt is the "mother of the world." "What happens there makes a significant difference," he said. Spontaneous celebrations dotted the New York area. People met up near the Egyptian Mission to the United Nations in Manhattan or waved flags Friday after noon prayers on Steinway Street in Queens' Astoria neighborhood. Ayman El-Sawa, an activist from Highlands, N.J., who has helped organize protests including one in Times Square, fielded more than 50 celebratory phone calls in just the first half hour after Mubarak shocked his homeland by finally crumbling and resigning. "But we should celebrate with one eye - and keep the other eye open for the next step: We have to be sure the army agrees with all the people's demands and does not repeat history," he said. In Brooklyn, physical therapist Khaled Lamada, president of the Virginia-based Egyptian-Americans for Development, got news about Mubarak on his cell phone while walking to noon prayers. "I feel great," he said. "I feel honored, I feel proud to be Egyptian." Contributing to this report were Associated Press writers Amy Taxin in Los Angeles, David Runk in Dearborn, Mich., Brett Zongker in Washington and Anita Snow at the United Nations, and photographer Frank Franklin II in New York.